The 52 AAFF 16mm Tour Program features 14 new films from Denmark, Argentina, Canada, Germany, and the United States including murmurations by Rebecca Meyers (52 AAFF Best Cinematography Award); Will o’ the Wisp by Andrew Kim (52 AAFF Tom Berman Award for Most Promising Filmmaker) and Charlotte Pryce’s A Study in Natural Magic (52 AAFF Stan Brakhage Film at Wit’s End Award). 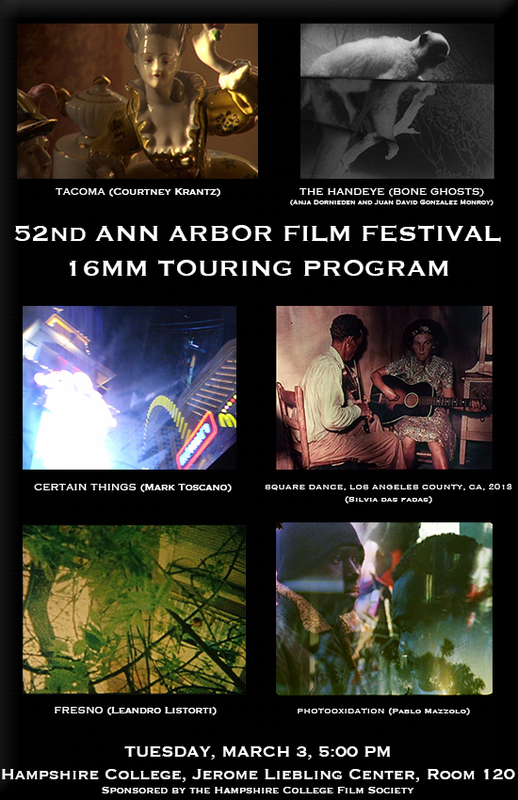 Six films in the program received their world premieres at the 52nd AAFF including Tacoma by Courtney Krantz; Fresno by Leandro Listorti; Sleeping District by Tinne Zenner; Certain Things by Mark Toscano; Square Dance, Los Angeles County, California, 2013 by Sílvia das Fadas; and Burn Out the Day by Sasha Waters Freyer. © 2019 Film/Photo/Video All Rights Reserved.